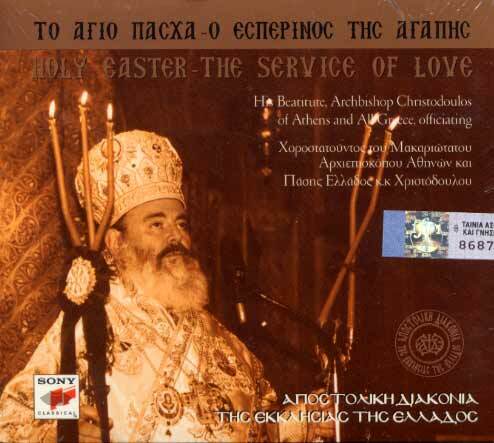 Recorded during the Sunday morning of Easter, on 30 April 2000, in Holy Metropolis of Athens, with archbishop Christodoulos officiating. The package contains a small book with the Service of the Eucharist. All the texts and the titles are bilingual (English, Greek). In "vespers Love", which takes place every time the morning of Easter Sunday, the gospel is read in nine languages (Greek, English, French, Russian, Italian, German, Romanian, Arabic and Latin). Reading of the first part of the Gospel of the Resurrection in various languages: Greek, English, French, Russian, Italian, German, Rumanian, Arabic, Latin.